The Cocoa Health and Extension Division (CHED) of Cocobod, has scaled up effort at helping to boost the nation's cocoa production through farmer education - exposure to improved farming technologies. As part of this, a day's forum had been held for more than 700 cocoa farmers at Juaben in the Ejisu-Juaben Municipality. Organized by the Mampong District CHED Office, it provided the platform to discuss ways to ensure effective pest and disease control, cocoa fertilizer application, cocoa pollination and the supply of hybrid cocoa seedlings. Mr. Geoffrey Sam, the Ashanti Regional Extension Officer of the Division, pledged strong extension support for the farmers to raise crop yield and returns. He spoke of the need for them to stick to best practices to maintain the quality of the beans. He touched on the recent erratic rainfall pattern, resulting from climate change, and said to deal with the worrying trend and save the industry, Cocobod had initiated moves to promote cocoa farms irrigation. This, he added, was already being piloted in five selected farming communities in the region. Mr. David Adom-Twum, Effiduase District Officer of the Quality Control Division, advised them to spray their farms with the right insecticides, to improve the quality and aroma of the cocoa beans for chocolate production. He warned of fake insecticides on the market and encouraged them to seek technical support from the extension agents during inputs acquisition and usage. 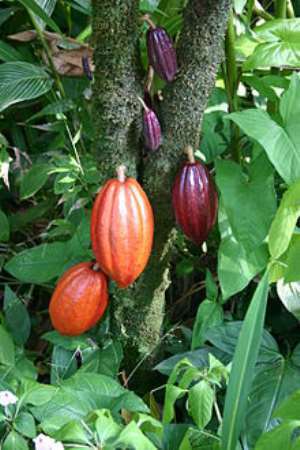 Mr. Stephen Asante, the Ejisu-Juaben Municipal Director of the Food and Agriculture Ministry, encouraged the unemployed youth to go into cocoa farming and said it was a rewarding business.